John Priest is a traditionally published as well as a self-published author of many wonderful children’s books. He lives in the UK with his wife, children, and grandchildren. Welcome, John! What is the title and genre of your book, and who published it? 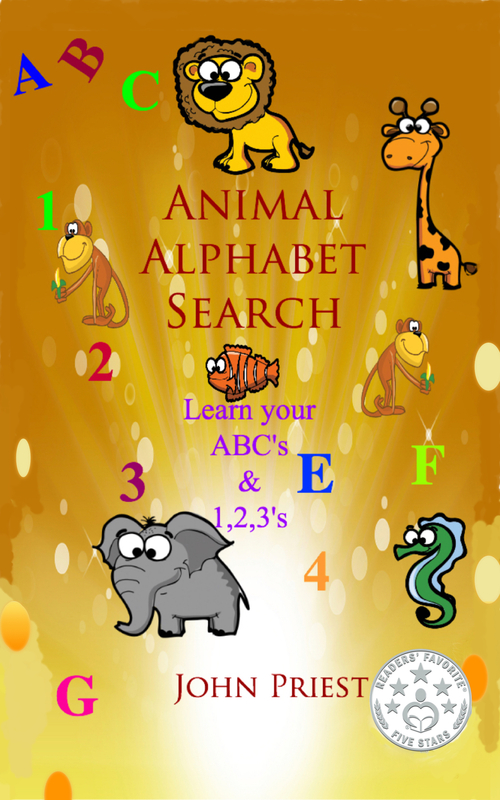 Animal Alphabet Search: Learn your ABC’s & 1,2,3’s. It’s a children’s picture book and has been published by Amazon in e-book form and as a paperback by CreateSpace. Tell us a little about your book. Each letter of the alphabet is hidden inside a particular animal and the child has to identify the letter, count how many letters are hidden in the picture and also name the animal. It helps a child with their alphabet, counting numbers 1-12, and animal recognition. What inspired you to write it? It was an idea I’ve had for some time and it’s been nice to finally get it written and illustrated. When did you first start writing? 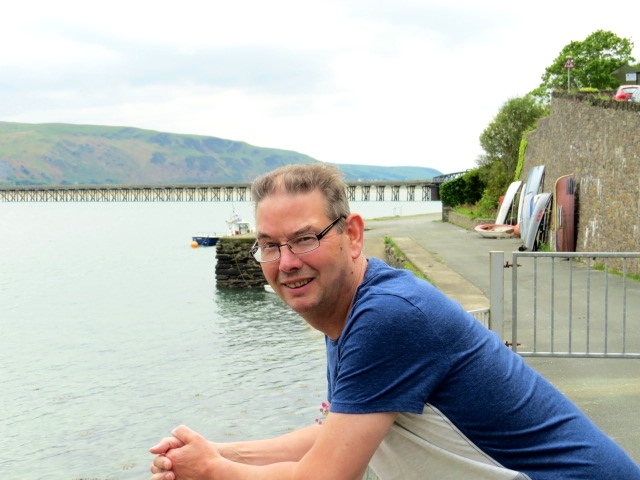 I started writing in 1985 after a serious leg injury left me unable to walk and continue my career. What authors have most influenced you? How and why? I have always loved a horror writer called James Herbert. His style of writing was always crisp and to the point without the padding you find in some books. My favourite children’s writers would be J.M.Barrie for Peter Pan and Roald Dahl for his brilliant imagination and writing. What was the first book that touched you deeply? Touched me deeply? That’s really difficult to answer as I try to steer clear of books and films that I know would be upsetting and are based on factual events. I think family life already has its fair share of sadness and upset without reading about it. So I’m a believer in writing happy imaginative books, ones that kids can lose themselves in and have a chuckle with some of my characters. What genres do you like to read? I will read anything apart from what I’ve mentioned above, kids and adult books, mystery, detective, horror, historical. If it looks fascinating and the blurb is good, I’ll probably read it. How do these books affect your writing? I suppose as an author I am never ‘just reading’ a book. It’s also about learning and honing your skills and becoming better with each book you write, so they do affect you on a professional level. Where do you like to write? Why? I will write wherever I fancy writing at that particular time. I am currently sitting in my garden with a laptop. Please note, this is unusual for the UK; the sun’s come out so I’m making the most of it! What time of day do you like to write. Why? I don’t mind, I can write at any time of the day, from early morning right up to 10.30 pm at night; not still outside in the garden though! In what genres do you write? My recent children’s books have been mystery, whodunit, detective, fantasy/sorcery and also picture books. E-books or paper ~ do you have a preference? I still love a good paperback. I know I can open it on a beach and it can get messed up with sand and seawater and I can still read it! I know the e-Book readers have come a long way and you can use them in the sunlight, so I might try one out. How and where have you marketed your work? My early work was marketed by traditional publishers and went into schools throughout the UK and worldwide. Self-publishing is a different game altogether, but I do have books with Amazon, Barnes &Noble, iTunes, Smashwords, Feedaread and other companies. Animal Alphabet Search: Learn your ABC’s & 1,2,3’s is available on e-kindle and through Createspace as a paperback. I am trying desperately hard to market via bloggers kind enough to take the time and effort to add me to their blogs, like this one of yours, Tina! Peter Challenge – Time Surfer: a fantasy, sword and sorcery book with starter chapters for ages 7-9 years. The Boomerang Mystery: first in the series of Jay-Pea-Eyes aka Junior Private Investigators. The Curse of Sea Shell Cave: second in the Jay-Pea-Eyes series. Traditionally published books: Naughty Nigel Runs Away; Tom’s Birthday Treat; Answer The Phone Fiona! I have also published articles in national UK magazines and have a couple of screenplays ‘circulating’ at the minute. What is your current writing project? My eldest grandson, who is just 4 years of age, has recently been diagnosed with a condition that has affected his whole body and obviously changed his life and those around him. I searched bookstores hoping to find something that could be read to him and relieve his stress and anxiety that accompanied his regular weekly visits to hospitals. Unfortunately the few I found were not helpful. I am determined that this will be my next book and I hope it will help other children/parents/guardians in their times of heartache and anguish. If you have a blog, what subjects do write about? I do have a blog but I don’t use it as much as I should. It’s something I’ve got to get to grips with. Where can your book(s) be purchased? They can be purchased on Amazon, iTunes Bookstore, Barnes & Noble, Feedaread, Smashwords. It’s easier to go to my site or my author pages. What advice would you give a new writer? If you want to write then do it. Don’t let anyone say you can’t. I can’t think of any other job I’ve done where someone asks you: So you’re a writer? What have you written? How much have you earned? Where are your books sold? So ignore the negative comments. You also need to read…and read…and study…and read. What do you wish to say to your readers? Thank you for your support, thank you for your reviews. We rely heavily on reviews; without them we wouldn’t survive. I have free book offers on my website for any of you who would like to become part of my Pre-launch team. It would be a privilege to have you reading and commenting on my books prior to them being published, as I value your opinions greatly. Can I also thank all the bloggers who take the time to mention authors and books on their blog-sites. It’s not easy and I know it’s very time-consuming, so thank you for doing this for us. Thanks Tina for the invite to be a guest author on your site and for the great write-up!